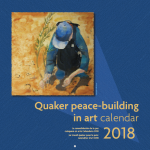 The 2018 Quaker peace-building in art calendar (30 cm × 30 cm) celebrates many kinds of peace-building and a variety of art works by Quakers from around the world. Short inspirational texts accompany the pictures, and a brief commentary introduces both the art and the peace-building work. These texts are printed in Spanish, French and English. 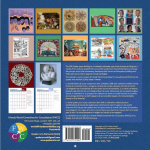 The calendar is a joint project of Friends World Committee for Consultation (FWCC) and the Quaker Arts Network (QAN), based in Britain. It can be purchased from FWCC at Friends’ House, or by post. Information available on the FWCC website. This entry was posted in Calendar items, FWCC, Publications, Quaker history, Spirituality, World community and tagged 2018, art, calendar, FWCC, peace-building. Bookmark the permalink.